Another exciting month of daily slots tournaments has begun at WinADay Casino. There is no entry fee for the unique slots site’s tournaments where nearly $500 in prize money will be awarded to the top scoring players every day until February 15th. 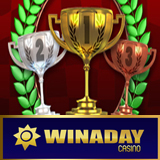 There is no entry fee for WinADay slots tournaments. All players playing the designated tournament slot of the day are automatically eligible for cash prizes up to $100 each. Competitors can check their current standings any time on the leaderboard on the Tournaments page of the site (http://www.winadaycasino.eu/en/tournaments) or by clicking the Tournaments icon within all tournament games. Every Thursday in February is a Thursday Fun Day when WinADay will add up to 50% to every deposit. Details on its low wagering requirements for Fun Day bonuses are available under the Promotions tab on the website. To celebrate Chinese New Year, WinADay’s Game of the Month for February is Chinatown, a 21 payline slot game with noodles, lotus blossoms and Ming vases spinning on its five reels and chances to win up to 15 free spins. At the end of the month one lucky Chinatown player will win $250. New players can take advantage of WinADay’s incredibly generous Welcome Bonus offer. Their first deposits are doubled, an extra 25% is added to second to fourth deposits, and a whopping 85% is given on the fifth. Most of WinADay’s premium slots are tied to one progressive jackpot which is currently over $210,000. There are also 10 penny slots, 6 video poker games, Roulette and Keno to choose from.